Safety is a major concern of ours. We adhere to strict safety standards outlined in the OHS Act 2004. We ensure every clean is completed in a safe, easy and hassle free manner. Our people are Working Safely at Heights Accredited and OHS Act 2004 compliant – we work with you to ensure all works are completed safely! We follow the ‘safety first’ rule with no exceptions and have Trade & Public Liability Insurance. We produce JSA & SWMS Reports and can provide you with visual before and afters. We pressure clean Buildings, Warehouses, Factories, Machinery and more using commercial pressure washers using chemicals or plain water. Hot Water pressure cleaning delivers unparalleled quality. It allows us to clean deeply soiled areas, oil, grease & machinery. Ask us for more details. The results will speak for themselves. Do your business windows need some love? We can clean up to 7 storeys safely from the ground. Our equipment includes telescopic carbon fibre poles and a purified water system that leaves spot free clean windows. 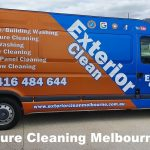 Exterior walls, tiles and bistro blind cleaning are also available. We work with you to create a safe working environment by using ropes, harnesses and Anchor Points. Additional roof reports can be provided (e.g. tin/tile condition, skylight condition, leaks, pointing condition, fascia board condition). For gutters, we are able to use boom and scissor lifts, harnesses, ropes, ladder stabilisers and temporary anchor points (as required).